The mews should be well-ventilated but draft-free. It should offer a hawk privacy if it wants it, protection from vandals and stray animals, and be designed so that the hawk cannot injure itself or its feathers. The mews should also be dry and well-drained. The minimum size for a mews is about 4' x 8' and 6' tall. Larger birds such as buteos, Harris' hawks, goshawks, and large falcons will be much better off in facilities that are at least 8' x 8' and 8' tall. Extra height is usually better than extra length or extra width. A hawk that can fly up to a high perch will stay in better muscle tone than one that just jumps from one perch to another at the same height. Mews that are too narrow will cause broken or "broomed" feathers because the raptor's wings brush the sides of the building when the bird flies from perch to perch. Sometimes mews can be too large, too. Some birds will abuse a large mews' extra room by flying into corners and banking off walls, suffering damaged feathers or even broken bones. Birds that jump around a lot when free-lofted may have to be kept tethered to an indoor or outdoor perch. If they continue to bate excessively, then the falconer should either invest in some additional manning time to calm the bird, or keep the hawk in a completely darkened mews. This last solution is usually unacceptable for periods of more than a week or two but is sometimes necessary for individual passage birds which become wild for a few weeks in early spring. In keeping with the requirement of dryness, a mews needs some kind of floor. If the soil permits good drainage, the mews can have an open, natural floor with no additional material Natural floors, however, are hard to clean, usually get dusty after a period of use, and don't offer protection against digging animals entering the hawk house. A better solution is a layer of pea gravel over heavy-duty wire, or on an elevated plywood or concrete floor. Plywood can be covered with heavy plastic and the gravel placed on top. This type of floor is easily cleaned by washing down and raking the gravel and can be quickly replaced if necessary. A concrete pad covered with gravel and fitted with a drain is excellent, too, although more expensive and more difficult to construct than a simple wooden floor. Concrete is also much less portable than even the heaviest wooden floor, but will, of course, last much longer. Instead of gravel, some falconers like artificial turf carpets. Most of these rinse clean fairly well and can be inexpensively replaced every six months or so. 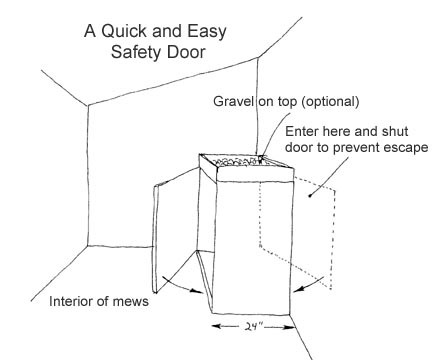 All mews should have some sort of safety chamber which prevents the raptor from accidentally escaping from the mews. Even if the bird in question has never shown the slightest inclination to bolt, accidents such as forgetting to latch the mews door can happen. The safety chamber can be either external or inside the mews. A few possibilities are illustrated. One good method is to simply attach the fully-enclosed weathering yard to the mews and allow it to act as a safety door. Another excellent method is to build a small entrance way or hall which then opens into the mews. These small rooms are convenient places to weigh the hawk or store extra equipment. Instead of building a chamber, some falconers drape a cloth or plastic sheet just inside the mews door opening. They step behind this and shut the main door behind them before entering the mews. This works better than nothing but is not as foolproof as a true safety chamber. A bird intent on escaping may crash into the barrier and get around it before the falconer can react. A safety chamber doesn't need to be a major production, but one of some sort should be present. Other features that are not essential, but are nonetheless useful include food chutes, water spigots in the mews, peep-holes, and heater elements. 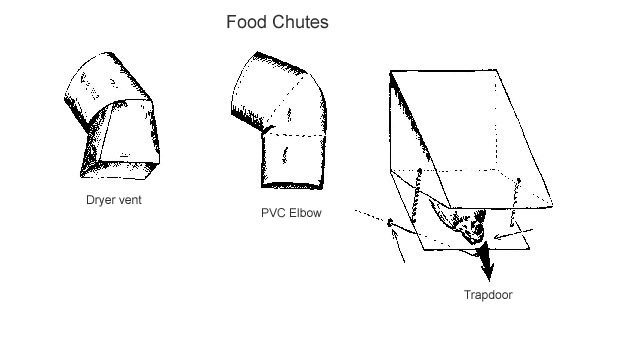 Food chutes are handy during the molt when the falconer may want to disassociate himself from food to prevent an imprinted raptor from screaming. Water spigots are very useful for filling baths and attaching hoses during clean-up. Peepholes are good for watching the raptor without disturbing it. Heater elements may be lifesavers for birds like Harris' hawks in cold weather. Smaller accipiters can also benefit from a heater that turns on when the temperature drops below a point. Unexpected cold spells can sometimes lower a small acccipiter's weight past the danger point.